United States Congress. "ロバート・ケネディ (id: K000114)". Biographical Directory of the United States Congress. 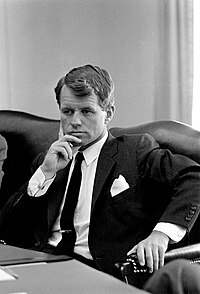 Robert F. Kennedy: Remarks on the Assassination of Martin Luther King, Jr.
ユーニス・メアリー・ケネディ (m.) Robert Sargent Shriver, Jr.
m. = 結婚; div. = 離婚; sep. = 別居.